Starting out in 1919, this year, the Ribble bus company celebrates its 100th year of service. The company first operated the journey between Preston and the Lancashire village of Gregson Lane, a journey which now forms part of Transdev’s Hotline bus route. In celebration of this anniversary Transdev has unveiled a double-decker with a cherry red and cream livery, the same as the iconic Ribble livery. 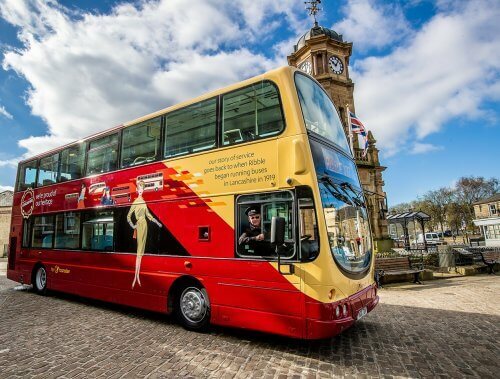 The centenary bus – which has received fleet number 100 – will be seen throughout central and East Lancashire during the year, on routes linking Preston, Burnley, Bolton and Accrington, including the Hotline service. Some of the employees who began their career at Ribble attended the unveiling of the bus. Transdev’s CEO Alex Hornby said: “People are always at the heart of what we do today, and so it’s entirely appropriate that our centenary bus features images of just some of the many generations who helped to make Ribble a household name in Lancashire. “Our design also features a selection of the people, buses and coaches which earned Ribble a formidable reputation far beyond its Lancashire roots and led to the company we are proud to work for today – including its pioneering double deck express coaches of the 1960s, the predecessors of our own premium and well-known Hotline, Red Express and Witchway brands.